Storm Jameson was the pen name of Margaret Storm Jameson Chapman, born in Whitby, Yorkshire. She graduated from the University of Leeds and earned a master's degree from King's College London in 1914. She worked as a teacher for a short time before launching her career as a writer. She had become a socialist and a strong advocate of women suffrage while at Leeds. She became a prolific writer who produced 47 novels, beginning with The Pot Boils (1919) plus plays, nonfiction books, poems, essays, biographies, memoirs, and her two volumes of autobiography, No Time Like the Present (1933) and Journey from the North (1969). After the end of an early and brief first marriage, she married Guy Chapman, also a writer, in 1926. In the early 1930s, she began a close friendship with Vera Brittain, who had also lost a brother in World War I and shared her pacifist views. 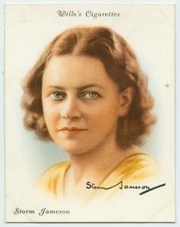 Jameson was active in British politics for many year and was a member of the National Union of Women Suffrage Societies, the Peace Pledge Union, and the International Union of Revolutionary Writers. She was a longtime president of International PEN. Storm Jameson is currently considered a "single author." If one or more works are by a distinct, homonymous authors, go ahead and split the author. Storm Jameson is composed of 4 names. You can examine and separate out names.